"The Legal Theory of Jürgen Habermas"
The chapter is published in "Law and Social Theory", ed. by Reza Banakar and Max Travers (Hart Publishing, 2nd ed. 2013). Mathieu Deflem is Professor of Sociology at the University of South Carolina. He is the editor of "Habermas, Modernity and Law" (Sage, 1996). Available as pdf copy here. Charles Larmore: "What is Political Philosophy?" "What is political philosophy’s relation to moral philosophy? Does it simply form part of moral philosophy, focusing on the proper application of certain moral truths to political reality? Or must it instead form a more autonomous discipline, drawing its bearings from the specifically political problem of determining the bounds of legitimate coercion? In this essay I work out an answer to these questions by examining both some of the classical views on the nature of political philosophy and, more particularly, some recently published writings by Bernard Williams and G.A. Cohen." Charles Larmore is Professor of Philosophy at Brown University. He is the author of "The Morals of Modernity" (Cambridge University Press, 1996) and "The Autonomy of Morality" (Cambridge University Press, 2008). 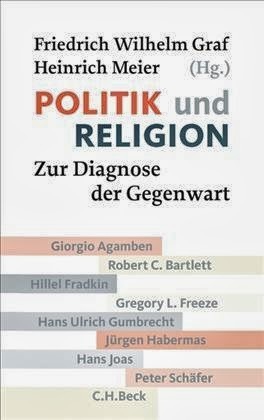 Neues Buch: "Politik und Religion. Zur Diagnose der Gegenwart"
Das Spannungsverhältnis von Politik und Religion ist zu einem zentralen Gegenstand öffentlicher Aufmerksamkeit geworden. Der politischreligiöse Radikalismus der Gegenwart hat die Sprengkraft augenfällig gemacht, die die Religion in sich birgt. Zugleich verbindet sich mit der Religion die Hoffnung, dass sie den gesellschaftlichen Zusammenhalt in der Moderne zu stärken vermag. International renommierte Wissenschaftler und führende Intellektuelle behandeln u. a. die Oszillationen von Politik und Religion in den USA und in Russland, das lange Streben nach dem Islamischen Staat, das Konzept der Theokratie, Judentum und Antike. Sie analysieren den Prozess der Sakralisierung und Entsakralisierung und formulieren grundsätzliche Positionen zur Bestimmung des Verhältnisses von Politik und Religion aus der Sicht der Theologie und der Philosophie. Heinrich Meier ist Professor der Philosophie an den Universitäten München und Chicago. 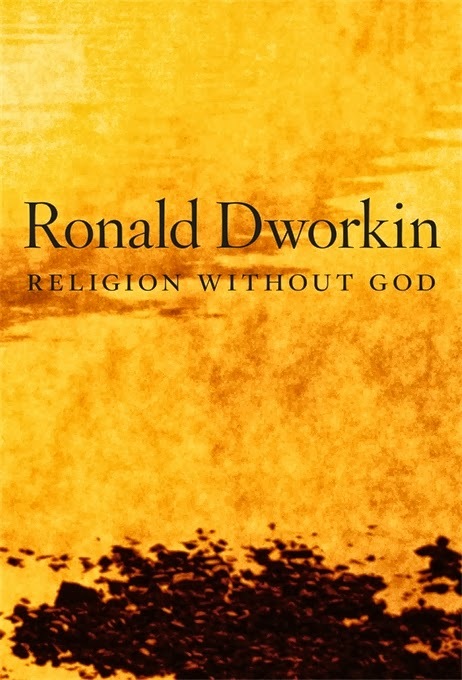 Ronald Dworkin - "Religion without God"
Read an except from the book here. The book is based on three lectures Dworkin gave at the University of Bern, Switzerland, in December 2011. See the videos here. "Self-Defensive Subjectivity: The Diagnosis of a Social Pathology"
New Book: "Religion in a Liberal State"
As religion has become more visible in public life, with closer relations of co-operation with government as well as a force in some political campaigns, its place in public life has become more contested. Fudged compromises of the past are giving way to a desire for clear lines and moral principles. This book brings the disciplines of law, sociology, politics and theology into conversation with one anther to shed light on the questions thrown up by 'religion in a liberal state'. 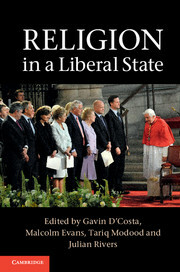 It discusses practical problems in a British context, such as the accommodation of religious dress, discrimination against sexual minorities and state support for historic religions; considers legal frameworks of equality and human rights; and elucidates leading ideas of neutrality, pluralism, secularism and public reason. Fundamentally, it asks what it means to be liberal in a world in which religious diversity is becoming more present and more problematic. "Es ist (....) zentral, klar zwischen Kosmopolitismus und Kosmopolitisierung zu unterscheiden. Kosmopolitismus handelt von Normen, Kosmopolitisierung von Fakten. Kosmopolitismus im philosophischen Sinn, bei Immanuel Kant wie bei Jürgen Habermas, beinhaltet eine weltpolitische Aufgabe, die von oben, also Regierungen und internationalen Organisationen, oder von unten, etwa zivilgesellschaftlichen Akteuren, durchgesetzt wird. Kosmopolitisierung dagegen vollzieht sich von unten und innen, im alltäglichen Geschehen, oft erzwungen, unbemerkt, ungewollt - selbst wenn weiterhin Nationalflaggen geschwenkt werden und Politiker die nationale Leitkultur ausrufen und den Tod des Multikulturalismus verkünden. Wie tief geht der Epochenwandel, der einen anderen Blick auf die Welt fordert? Erleben wir vielleicht sogar eine neue Achsenzeit? Wir wissen es nicht." "Die Zeit" (September 5, 2013) asked 48 artists and intellectuals how they are going to vote in Germany’s federal election on September 22. "Nach meinem Eindruck steht die ungare Stimmungslage vor der Bundestagswahl in Zusammenhang mit der Tabuisierung des Themas, das eine kleinmütigperspektivenlose Kanzlerin aus machtopportunistischen Gründen unter dem Deckel halten möchte. Ich meine die Krise einer Währungsunion, die auch aufgrund der Kurzsichtigkeit und des national bornierten Gerangels der in Brüssel versammelten Regierungschefs auf dem halben Weg zu einer politischen Union feststeckt. Zu Hause legt sich der Wortschwall der Verleugnung wie ein Schaumteppich auf die Köpfe einer verunsicherten Bevölkerung, die es besser weiß und doch an die unglaubwürdige Botschaft des im eigenen Garten gesicherten Wohlstandes glauben möchte – mag es den Nachbarn noch so schlecht gehen. In dieser Situation empfiehlt sich Peer Steinbrück als ein Politiker von ganz anderer Statur – durchsetzungsfähig, zukunftsorientiert und verantwortungsbereit, ein Charakter mit Sinn für das, was relevant ist. Rot-Grün traue ich den Mut zu, die Alternativen offen auf den Tisch zu legen und Frankreich fur einen echten Politikwechsel zu gewinnen. Um für den Kurs in Richtung eines demokratischen Kerneuropas Mehrheiten zu schaffen, wird sich freilich am Ende die ganz große Koalition der zwei einhalb europafreundlichen Bundestagsparteien zusammenfinden müssen. Dafur haben SPD und Grüne schon in der Opposition Vorleistungen erbracht. Deshalb sollten sich beide Parteien, wenn es denn weder für sie noch für Schwarz-Gelb reichen sollte, auch nach der Wahl nicht trennen – und, sei's drum, mit einer in Europafragen tief zerstrittenen Union nur gemeinsam die nächste Regierung bilden." See also my post: "How Germany's Political Elite is Failing". John Buschman is Dean of University Libraries at the Seton Hall University. "How Germany's Political Elite is Failing"
"Jürgen Habermas ..... recently diagnosed a collective failure of Germany's political elites. At a time when Germany faces historic decisions about the future of the European Union, its politicians are waging an election campaign about banalities. At the same time, German and foreign academics are discussing these historic challenges in great depth [......] I've tried to capture the strange asynchrony between this year's election campaign with its bizarre controversies and the academic range of opinions about the current German Question in an essay for the journal Juncture, which belongs to a progressive British think tank, the Institute for Public Policy Research (IPPR)". "Property-Owning Democracy: A Short History"
"The rise to prominence of the term “property-owning democracy” in late twentieth-century political discourse and political theory is, on the face of it, a confusing and contradictory story. Political theorists following in the footsteps of John Rawls alighted upon the idea of a property-owning democracy in the 1980s and 1990s as a non-socialist model for the advancement of egalitarian distributive objectives. In the same period, intellectuals and politicians associated with the rise of neo-liberalism, in particular those attached to the Thatcher government in the UK, sought to foster a property-owning democracy that was indifferent to a significant widening of income and wealth inequalities and was explicitly intended to undermine the electoral base of egalitarian politics. But these two versions of this fertile objective were not as distinct as they might appear, since both had in fact grown from the same historical root." The paper is published in Martin O’Neill and Thad Williamson (eds.) - "Property-Owning Democracy: Rawls and Beyond" (Wiley-Blackwell, 2012). See my post on the book here. Ben Jackson is Lecturer in Modern History at the University of Oxford.